If you've been keeping up with my posts lately, you'll know that my husband has been gone for six weeks working in Europe. I was lucky enough to be able to go along with him for the first two weeks, but I hadn't seen him in a month, and the kids hadn't seen him for the entire time. Well, he returned on Saturday! He had to leave for the trip on his birthday, so we really didn't get to celebrate much. My daughter decided that we needed to throw him a small birthday/welcome home party on Sunday--she was in charge of decorations/games and then we both baked a cake. We had a hard time settling on something, but she knew she wanted to use some blackberries I picked a couple of weeks ago (and froze). 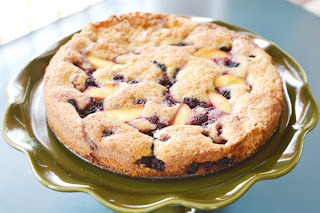 We finally decided on this blackberry peach cake. It turned out great! I was a little worried at first because 1) I didn't have any port as called for in the original recipe, 2) the cake batter barely covered the bottom of the pan, and 3) my husband isn't too fond of cakes. I should learn not to worry so much. I just used some dry red wine with a little extra sugar added for the sauce; the cake rose nicely; and it turned out to taste and feel more like a coffee cake than a traditional one. 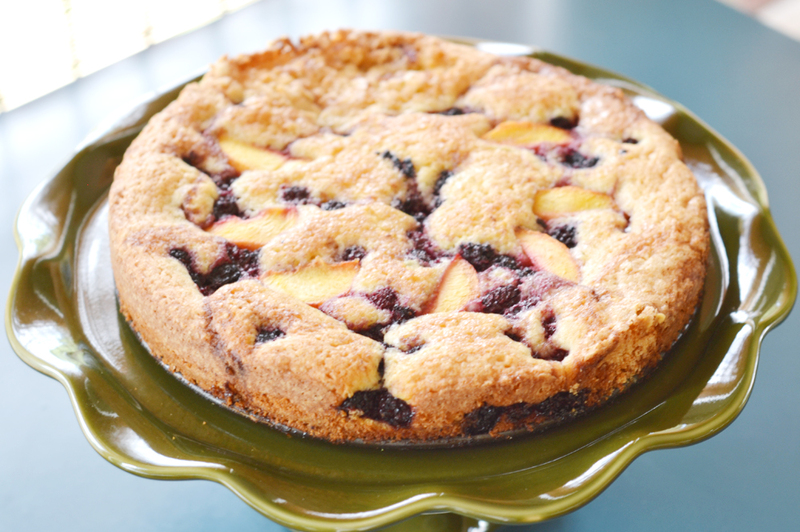 The only thing I'd do differently is add an extra peach, chopped up and distributed along with the blackberries. The recipe below is the version I actually baked. And, yes, we're all ecstatic to have my husband home! Combine the berries, the wine and 1 tablespoon plus 1 tsp sugar in a small bowl. Mix to coat. Set aside. Combine the flour, baking powder and salt in a medium bowl. Set aside. In a larger mixing bowl, beat the butter and 3/4 cup sugar until light and fluffy. Beat in the eggs, one at a time, making sure that each one is completely combined before adding the next. Mix in the vanilla. Slowly add the flour mixture and beat at a low speed until just combined. Grease and flour a 9-inch springform pan and cover the bottom with parchment paper (especially if you'd like to transfer the cake off of the pan after baking). Spread the batter evenly over the bottom of the pan. Using a slotted spoon, spoon the berries over the batter. Drizzle the wine mixture over the berries. 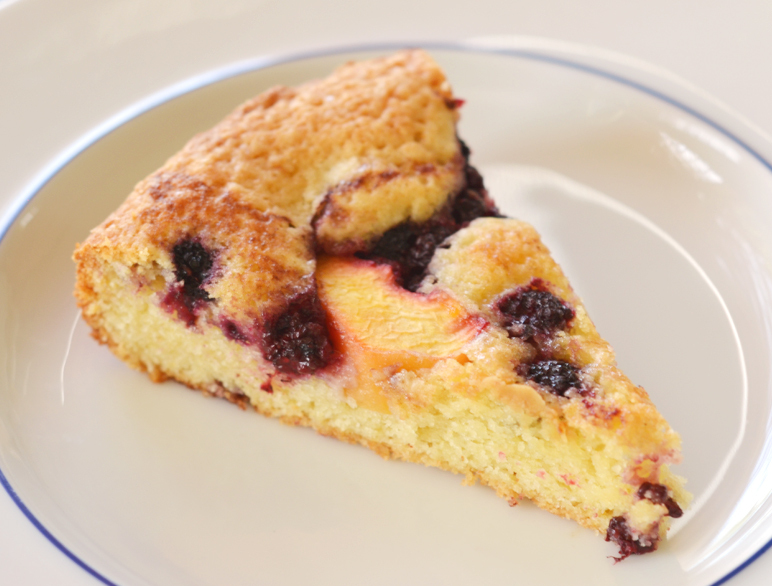 Place the peach slices in a decorative pattern around the cake. Sprinkle with some of the vanilla bourbon sugar/demerara. Place the pan on a cookie sheet (to prevent the juices from scorching the bottom of your oven!). Bake for 40-50 minutes, or until the cake is golden brown and a toothpick comes out clean. Let cool for 10 minutes, and then run a thin knife around the edge. Carefully remove the ring around the pan and serve! It was a wonderful and delicious welcome back! What a great summer dessert! This looks silly delicious!! Hello, I know I contacted you before, but just wanted to pass on that a blogging buddy of yours asked me to contact you about posting a few of your recipes... They would like to add your recipes to their eRecipeBOX..